Reminder: I'm doing a live video chat today at 3:00 Mountain time. 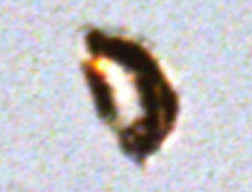 Another day, another grainy, out-of-focus, weird UFO picture trumpeted by the media. Well, not so much the media as The Sun. The headline screams, "Tourist snaps UFO in Croydon" and is accompanied by what one guesses is the best of the series of pix. It was quite large and moving really fast. It was size of a plane but did not look like one – it looked more like a big mushroom. I'm not saying it was a mushroom -- that's as likely as it being an actual spaceship -- but it's resemblance to a hat being blown across the sky by the wind is perhaps more a clue of its origin. ...then again, we're talking Croydon here. Maybe it's the Fourth Doctor's hat. Call Sarah Jane! Tip o' the tin foil beanie to Fark, as usual, and I note that they now have a Sarah Jane joke in the comments as well, but I was first.